A dog couch cover is a must have for every pet parent who values time spent snuggling up close with his or her beloved dog. Every dog lover knows that one of the joys of having dogs in the house is that they can make dull moments really interesting. They can snuggle up to you while you’re watching TV or even enjoying a good read. And when you’re feeling all gloomy and down, they can comfort you, too. Unfortunately, they can also use your furniture as their personal comfort zone when you’re not around, leaving your sofa, recliner, couch, or even loveseat at their mercy. 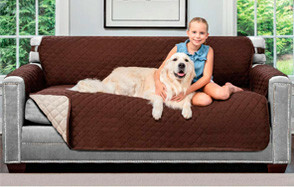 Protect your furniture with any of these dog couch cover products. It will save your furniture from pet-related damage while also simplifying their upkeep. 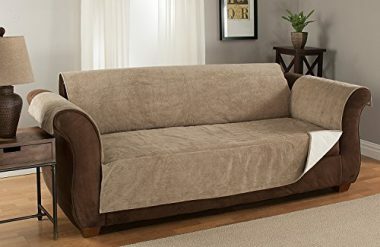 One of the most trusted names when it comes to furniture covers is the Original Sofa Shield which features a variety of useful characteristics that can simplify the process of maintaining the integrity of one’s furniture which can include sofas, chairs, recliners, loveseats, chairs-and-a-half, and even futons. Designed with an elegant quilted look, the fabric used in the manufacture of the Sofa Shield gives a new dimensionality to your living room or whichever room your furniture is located. Each slipcover is designed to be fully reversible so you have the option to change the look of your furniture with relative ease. The Sofa Shield is not waterproof so it’s best to keep this in mind. Sofa Shield says they purposely did not make the fabric waterproof because of the risk of having the liquids roll across the surface of the dog cover for furniture and onto the floor. It can withstand small drops from time to time, though. When Sofa Shield said that their slipcover isn’t waterproof, it doesn’t mean that it can no longer protect your furniture from other surface contaminants such as pet hair, food particles, and dirt and debris from everyday happenings. It cannot be used on leather furniture, unfortunately. Even with its 2-inch wide elastic strap, the cover can still move around when used on leather surfaces. 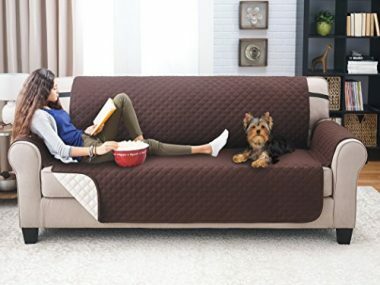 With a great combination of elegant design, ease of use and cleaning, sufficient furniture surface protection, and a very friendly price, the Original Sofa Shield surely is a great option for many pet parents. If you’ve got a furry canine pal that is making a real mess on your sofa, loveseat, recliner, or even your bed every time you’re not home, then maybe it’s time to consider getting a really tough furniture reinforcement without sacrificing the luxurious look and feel of your furniture. This is exactly what the Mambe Blanket Company has to offer with its Furniture Cover for Pets and People. Unlike other dog covers for furniture that can only integrate water-repellent materials into their construction, Mambe ups the ante by sandwiching a 100% waterproof membrane in between panels of super-lightweight and extra-soft fabric made of micro-fleece. But this is actually not the only thing that pet parents love about the Mambe. While the design technically calls for 3 layers of fleece-membrane-fleece arrangement, the finished product actually doesn’t show such complex layering. This is accomplished by fusing the three layers together to create a unitary fabric laminate design. What this simply means is that you’ll never have to fret about the middle waterproof membrane becoming crinkly and lumpy. Your Mambe will still look and feel like the first day you bought it. Mambe has a very unusual design for a dog cover for furniture. Looking at it, Mambe is more like a drape than it is a dedicated furniture cover. There’s definitely a plus side to this. Since it has a more or less open-ended design, the Mambe can actually be used to cover on almost anything. Its construction is also exceptional since it works well on cloth surfaces, clinging onto the surface even without straps or any other form of secure mechanism. Unfortunately, it doesn’t work well on slippery and slick surfaces like leather and glass. Also, being a drape-like furniture cover, some pet parents actually believe it is a rather expensive type of blanket that you put over your furniture to protect it from your pets. Nevertheless, the Mambe is a great choice because of its waterproof and versatile design. 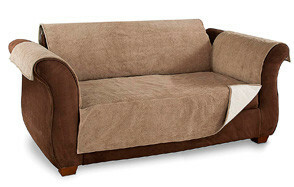 There are 2 things worth noting about the Bella Kline Design Reversible Sofa Furniture Protector. First, it’s the least expensive in this list at a little under $25, making it a great choice for those who prefer to keep such things as economical as possible. Secondly, the Bella Kline also comes with 2 storage pockets on one of the arm flaps. Sadly, the company only thought of putting these pockets on one end of the dog cover for furniture. Nonetheless, this should come in handy as an additional storage solution for your magazines, remote controller, or even tablet and smartphone. It doesn’t come with elasticized straps, though so you’d have to tuck the rear flaps under your seat cushions. Hopefully, your seat cushion won’t move as you move since this will also dislodge the Bella Kline from its attachment. 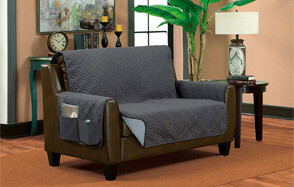 Its quilted look gives your room a whole new design dimension. It is not waterproof, although it is finished with water-repellent coating. This should come in handy when ensuring ample protection from your dog’s accidents. Overall, the Bella Kline dog cover for furniture makes for an excellent furniture protector because of its amazing combination of water-repellent features, reversible design, pocket-friendly pricing, and added storage functionality. 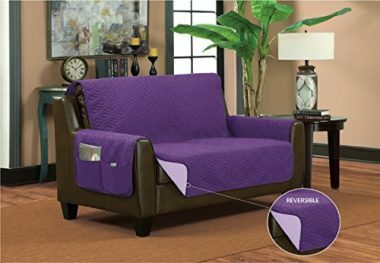 Elaine Karen’s Deluxe Reversible Sofa Furniture Protector comes in with mixed reviews. Overall, the quality of its fabric is considered by many pet parents to be generally acceptable. Sadly, it is seriously let down by inconsistencies in its sizing with a number of pet parents complaining about the exactness of fit to their respective furniture. Another concern that people have about the Elaine Karen is that the material actually moves over the surface of the furniture. Perhaps this has something to do with the fact that it comes with a removable elastic strap instead of a fixed but adjustable strap. Regardless, it is still a great choice for pet parents who want ample protection for the chairs, recliners, and sofas while adding a different kind of aesthetics to their room. 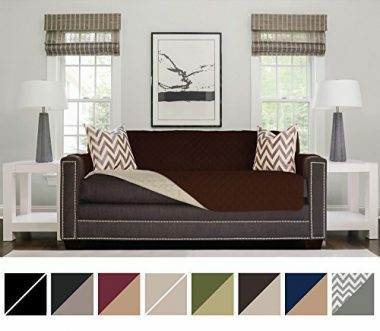 The Elaine Karen is available in 10 color combinations giving you the ability to choose one that should match well with your existing interior design. 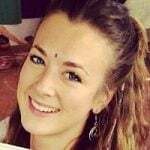 Now that should help you decide in favor of the Elaine Karen. The Furniture Fresh Heavy-Weight Luxury Textured Furniture Protector and Slipcover is this list’s most expensive, and for good reason. First, the microsuede fabric used in its construction looks and feels exceptionally luxurious. The same fabric also adds weight to the furniture protector, augmenting the security afforded by its elasticized, adjustable straps. Second, the Furniture Fresh comes with water-repellent finish; although a waterproof layer would have greatly made a difference. Third, it comes with a backing that is designed specifically to grip the surface of your furniture. At the very least you will not have to worry about the furniture protector slipping. It even works on leather surfaces, making it an invaluable dog cover for furniture that are made of leather. What’s the downside, you ask? Well, Furniture Fresh isn’t really reversible since the backside is composed of that anti-slip material that is keeping it secured onto your furniture’s surface. If you own leather furniture, then its hefty price tag is well worth it. If you have fabric furniture you can still rely on its anti-slip features. This is actually what makes the Furniture Fresh well-loved by pet parents. 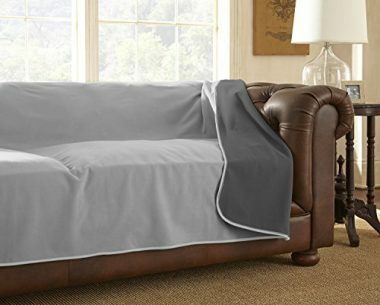 Protecting your furniture from pet accidents, spills, shedding, dirt, and other particles that may be brought by your dog can be made super easy by using any of these 5 best dog covers for furniture. While not all of these are waterproof, all of them will nevertheless protect your furniture while adding a new design element to your room.